We have been chosen by State Bank of India as Lenders' Independent Engineer to oversee the overall implementation of the Hyderabad Metro Rail project strictly as per the Concession Agreement. Being a very complex project both in terms of technology and scale, the Lenders required a Rail Systems Consultant with high level of competency and experience in handling mega rail projects. 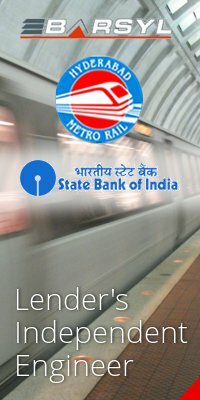 We are proud that State Bank of India have chosen us to be their Engineering partner in this mega project. BARSYL's engineers & professionals have executed mega rail projects successfully across the globe. However, challenging a rail project, trust us to deliver. Always. The Hyderabad Metro Rail network is a very ambitious project being executed by L&T Limited. The estimated cost of the project is Rs.12,132 crores. Three corridors spanning a length of approximately 71.16 km are to be taken up in phase-I to connect various parts of Hyderabad city. When completed, Hyderabad Metro Rail will usher in an eco-friendly mode of travel by reducing air and noise pollution in the city while providing a fast, reliable, convenient transport system to the citizens of Hyderabad city. Our assignment commenced in June 2012 and is presently in execution. Serving clients in over 15 countries. Balaji Railroad Systems Private Limited. P: & F: +91 40 27847804-06. © 1986-2014. BARSYL. All Rights Reserved.